A habit is simply the repeated tendency of an individual, towards a certain behaviour. When behaviours are repeatedly performed, they become habitual and neural pathways are created in the brain, strengthening and reinforcing the action of the habit (1). Smokers will reach for another cigarette instinctively. Drinkers will order another beer without consciously thinking. Drug addicts won’t question having another hit. After time, these become automated rituals, performed without conscious analysis. Breaking and making new habits can be hard because it requires the brain to change to accommodate. This is why quitting drugs and stopping alcohol can’t be seen as an overnight modification. It takes time. A common assumption is that it takes 21 days to change a habit. The reality is the evidence suggests it takes longer. It is not totally clear where the figure of 21 days came from. Many suspect it originates from a 1970’s book written by Maxwell Maltz called Psycho-Cybernetics. 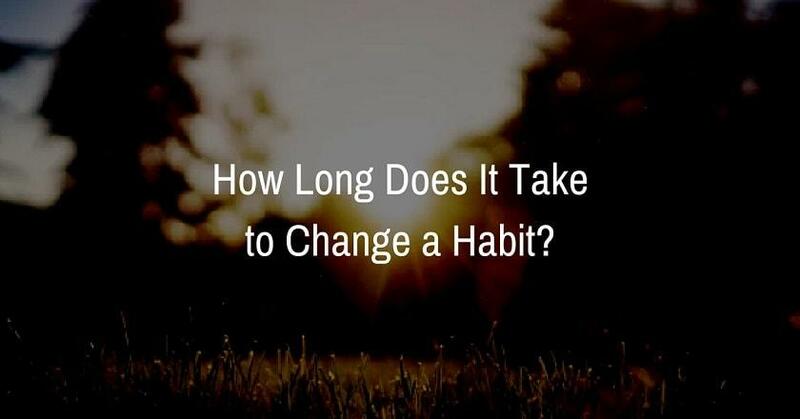 In his book, he suggested it took a minimum of 21 days to change a habit. Research from Phillippa Lally from University College London indicates that it takes on average around 66 days to change a habit (2). She examined habit formation in a study of 96 people over a 12 week time frame. Study participants could choose an array of habits to implement, from exercising daily to drinking water. The study found that it took participants on average 66 days to form a habit. Researchers were able to estimate the long end of habit change for some participants – this being 250 days (even though the study ran for just 12 weeks). This study provides some evidence for helping people to make decisions around habit change such as quitting alcohol or drugs. 21 days isn’t enough time for the brain to change substantially. This is why most rehabilitation centres recommend 60 days or more. Thirty day drug and alcohol rehab programs are popular the world over. There serve a real bona fide purpose to bring change to people’s lives. People enter a supportive and structured environment without the normal drug or alcohol enforcing triggers. However, we can’t assume that when someone leaves rehab after 30 days they’re all set. As the study suggest, a term closer or over 66 days is more likely to yield a better recovery probability. In any case, recovering long term requires support and guidance well into the future regardless of rehab stay. Anecdotally, we notice that people that stay on the longer end of the spectrum, are more likely to respond to treatment. If you are in the midst of drug and alcohol addiction and you are wanting to seek help or guidance, please speak to your GP and or medical specialist. If you’re considering drug or alcohol rehab (or for a loved one or friend), you are more than welcome to talk to Barbara Kustra or her team here at Refocus. We can provide some guidance in determining whether private rehab is the right option. To speak to us, call (03) 9826 0949.